Like last month, the Bank of England Governor Carney will narrowly avoid writing a letter to the Chancellor this week. We expect headline CPI to remain unchanged at 3%, but more importantly, we think this is a peak. 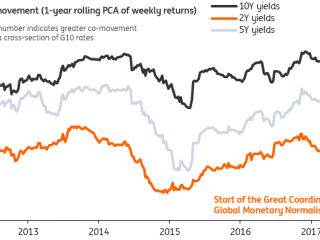 The bulk of the pound's depreciation has now passed through to inflation, and both core and headline inflation will start to trend lower through the spring. The question now is whether 'domestically-generated' inflation will speed up next year - but sluggish growth and political uncertainty could limit firm's ability to increase prices and wages. It's certainly fair to say the jobs market is going through a rough patch. 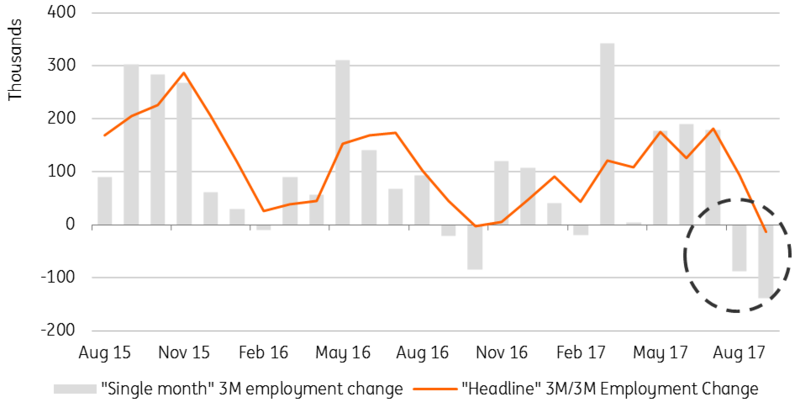 The headline measure of employment looks set to have fallen by roughly 35,000 thousand (3M/3M average) in October. It's entirely plausible that this is just noise, but the latest services PMI also suggested that the rate of hiring has slowed. One explanation is that the sluggish growth we've seen this year is starting to take its toll - in the same way, that a burst of economic strength at the end of 2016 buoyed the jobs market earlier in 2017. If the jobs market is indeed starting to turn, then this could have consequences for wage growth. There has been some renewed momentum in earnings over recent months, although part of that is down to the higher national living wage. The Bank of England expects a real pick-up next year following some positive signals from their agents. There are skill shortages reported in certain sectors, although the wider economic slowdown, slimmer margins (as import costs rise) and political uncertainty mean wage growth may not take off quite as much as the Bank is hoping. Expect average earnings growth (ex. bonuses) to stay at 2.2% on Wednesday. The arrival of Black Friday has given statisticians a real headache when it comes to seasonally adjusting November spending numbers, which is why it's worth taking last Thursday's figures with a pinch of salt. But statistical noise aside, the British Retail Consortium has said that shoppers didn't spend as much as hoped. Prices (of food in particular) are still rising faster than wages, and this means consumers are cautious when it comes to non-essentials. The Christmas period could be a tricky time for retailers. Last week's Brexit breakthrough should herald a relatively swift agreement on a post-Brexit transition period - something Bank of England Governor Carney has been pretty vocal about over recent months. If a transition deal is agreed early next year, this should help unlock some short-term investment as the risk of a cliff-edge in 2019 fades. This means the Bank of England may strike a cautiously optimistic tone this week - although we suspect the MPC will keep its cards close to its chest when it comes to the timing of another hike. Having said that, policymakers have signalled they'd be comfortable with one hike in 2018. So a February, or more likely, May rate rise can't be ruled out. But there are still some big Brexit questions to be resolved next year, not least when a final trade deal will be agreed. And with the economy still struggling to regain momentum, we still caution that a hike next year is far from a done deal.